As reported in the WDATCP Wisconsin Pest Bulletin updates, also featured weekly here on the Wisconsin Crop Manager Newsletter blog site, the western bean cutworm degree-day model indicates that 75% or more of the adult population has emerged as far north as Stevens Point in Portage County. Moth counts have begun to decline across the southern half of the state. By contrast, emergence is about 50% complete (peak emergence) in the north-central and northeastern counties. High counts for the period of July 12-18 were 135 moths in the black light trap near Sparta in Monroe County and 96 moths in the pheromone trap near Wautoma in Waushara County. For field corn, use an economic threshold of 5% field infestation with egg masses and/or small larvae. 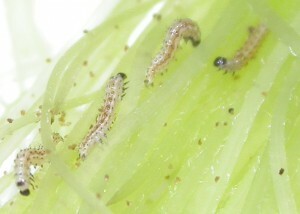 Processing sweet corn threshold is 4% field infestation with egg masses and/or small larvae. Female western bean cutworm moths prefer to lay eggs in pre-tassel fields. Most field corn fields have tasseled and are in the critical pollination stage. Drought stress has led to a more varied landscape among fields in terms of tassel and silk development and pollination stress or success. Talking with Joe Lauer, UW Madison Corn Agronomist, today there are unfortunately drought-affected fields that have tasseled and pollination was disrupted by the drought resulting in barren ears. Keep in mind that as tassels in cornfields emerge and dry, female moths seek later-developing cornfields (field and sweet corn) or dry beans for oviposition. It’s important to scout fields now that have tasseled and have silk development, as well as any later planted field corn or sweet corn planting dates that may still be at pre-tassel or tasseling stages. In a couple of calls over the last week, growers have been in the field scouting for twospotted spider mite and that is when they have noticed western corn rootworm adults. Remember to scout for western bean cutworm egg masses and/or small larvae at this time before larvae enter the ear. This article features pictures of early instar larvae, which look quite different than later instar larvae found in ears. Western bean cutworm egg mass near/at hatch. Egg mass turns from cream colored to purple 24-48 hours before hatch. Newly hatched larvae consume the egg shell, so egg masses are most evident before or immediately after hatch. In addition to egg masses, look for early instar larvae on plant surfaces (leaves, tassels, leaf axils, silks) before larvae enter the ear. (Photo: E. Cullen, Univ. of Wisconsin-Madison). 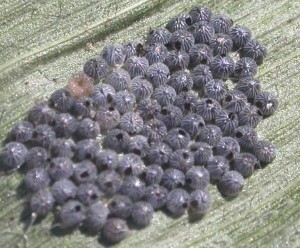 Scout cornfields for eggs and larvae by examining the upper surfaces of the leaves at the top of the plant, and leaves above and below the ear zone. Examine 20 consecutive plants at five locations in the field. Fields with uneven growth stages, different planting dates, or planted to different hybrids should be inspected thoroughly because oviposition occurs over several weeks and female moths prefer to lay eggs in pretassel corn – so planting date and tassel development sequence will give you a guide as to which fields to scout first. In addition to eggs, look for small larvae on leaf axils, at the intersection of the leaf and stalk, and on silks and husks. If economic thresholds have been reached, insecticide should be timed after 90-95% tassel emergence. Larvae must encounter insecticide or residue before entering the ear – once they enter the ear insecticide will not contact larvae, making control ineffective. Many Bt Corn hybrids include western bean cutworm in the spectrum of control, but a few do not. Refer to the following publication for a quick reference of Bt traits and above-ground insects control spectrum. Handy Bt Trait Table (Difonzo and Cullen, 2012).